Tahereh Mafi has entered the Young Adult scene with a defiantly striking and distinct prose in her debut novel Shatter Me, garnering mixed responses from readers, some overtly displeased while others embraced the change in style. I, for one, revelled in the beauty of the words and the stream-of-consciousness-like writing. Perhaps being different isn’t all that great in such a media when the literary norm has been set in concrete centuries ago, with little transformation and originality able to be done by new writers. Mafi’s prose is a perfect fit for Juliette’s character, however, because she’s someone who has been locked away for 264 days, away from civilisation and zero contact with others, so, therefore, the way in which she thinks, reacts and perceives to the world around her has altered, and this change is exhibited in the writing – only, really, if you want to see it that way. Additionally, Juliette’s love of words, of numbers, and of writing in her journal may also be a contributing factor, with Mafi creating a style that screams ‘Juliette’. Although it took a while to adapt to Mafi’s writing, I’ve developed a taste that I would love more of.I’ve been locked up for 264 days.I have nothing but a small notebook and a broken pen and the numbers in my head to keep me company. 1 window, 4 walls, 144 square feet of space, 26 letters in an alphabet. I haven’t spoken in 264 of isolation.6,336 hours since I’ve touched another human being.Juliette’s inner struggle to accept who she is, with an ability such as hers, is something that makes falling in love with her easy. Throughout Shatter Me she is manipulated, ordered and forced to use her power, tried to be shaped by Warner into a weapon against enemies of The Reestablishment, something that Juliette wants no part of. Her disastrous past combined with her naught self-acceptance and the destruction she knows she can cause becomes Juliette’s formidable force and resistance against those that want to use her. 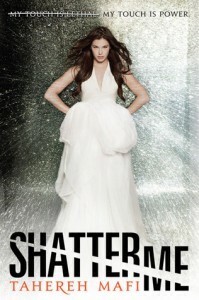 Slowly throughout Shatter Me she discovers more about herself and her ability through her journey from escaping Warner’s grip with Adam, a childhood friend and somebody she can touch, to Omega Point, the base for the resistance filled with people just like her. There was much to take interest in when it comes to Juliette.I took a sincere liking to Adam. At first his deceiving to Juliette in the beginning under Warner’s orders made me weary of him, but as the novel progresses you hope Adam is the one that Juliette will be with in the end. The more the two of them are with each other the more we see them change, be truthful, be accepting of one another’s secrets, finally with someone that they can confide in things with. Shatter Me centralises on Adam and his predicament as an older sibling and guardian for his younger brother. There is also Warner, who was the main antagonist in this novel, and is pretty evident to become a love interest as such books usually go. I detested Warner for his conniving, manipulative, and dominant stance with the people around him. Of course, it comes with his position. For me, Warner was very one-sided in Shatter Me, only ever after one thing: Juliette, either that be for her power or to sate his possessiveness and obsession to be with Juliette romantically. He was a complete and utter psycho, someone who I would love to treat by bashing his loose head against the ground at Juliette’s feet.Mafi’s thrilling plot from Juliette’s escape from isolation to Juliette’s discovery of others like her makes Shatter Me a pretty good beginning to the trilogy. However, I was holding out for more in this book than just a precursor and introductory to what can be expected from the second book. The conflict scenes were resolved all too easily, with a fake kiss being used for one of them as a tool for escape and defence, a tool for kindling vulnerability. The way the story unfolded worked though, with Omega Point being almost like a paradise; Juliette and Adam are on a journey to find this haven, even if it took a while to come to it.Mafi has created a world where fans of X-Men and The Hunger Games can enjoy seeing two of their enjoyments, superpowers and dystopia, mash together in a surprising and moving tale of self-discovery and self-acceptance.